By now you know I am a 100% gamer mom. Will took to gaming early in life and recently Charlie has followed in his footsteps. What I love about it is that gaming gives us an indoor family activity for nights when we really just want to chill. Here are Will’s favourite new games, including the smash hit Mario Party 10 and what I like about them as a mom. Plus a little glimpse into Nintendo’s soon to be released Mario Maker in celebration of 30 years of Super Mario Bros.
Before we start with the new, I wanted to update you on the Amiibo review I did. Having spent a lot more time with the Amiibo characters, I actually love them as a concept. They work easily with the 3DS as well as the WiiU and definitely bring a new element into each of the games. The best part is that they are ridiculously cheap at $13 per Amiibo. I pay more for Charlie’s new obsession, Shopkins, which are literally tiny plastic groceries that do not do anything. I digress. Try Amiibo, skip Shopkins. In the new Mario Party 10, you and your kids can team up together to defeat Bowser or choose one of you to actually control Bowser using the WiiU Gamepad. I’ve played a lot of Mario Party over the years and fell hard for this one. Will absolutely loves it. His favourite parts are that you can play as Bowser (my favourite part too) and that you can use Amiibo in the game. The game is much more interactive than other Mario Party games and introduces fun elements like actually riding rides in Mushroom Park. 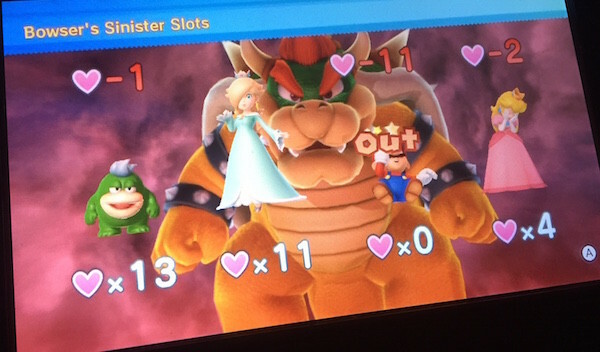 From my point of view Mario Party 10 is one of the better games we’ve tried. Charlie at 5 is easily able to play and its fun to play as Bowser and pit the kids against me in a battle of good versus evil. 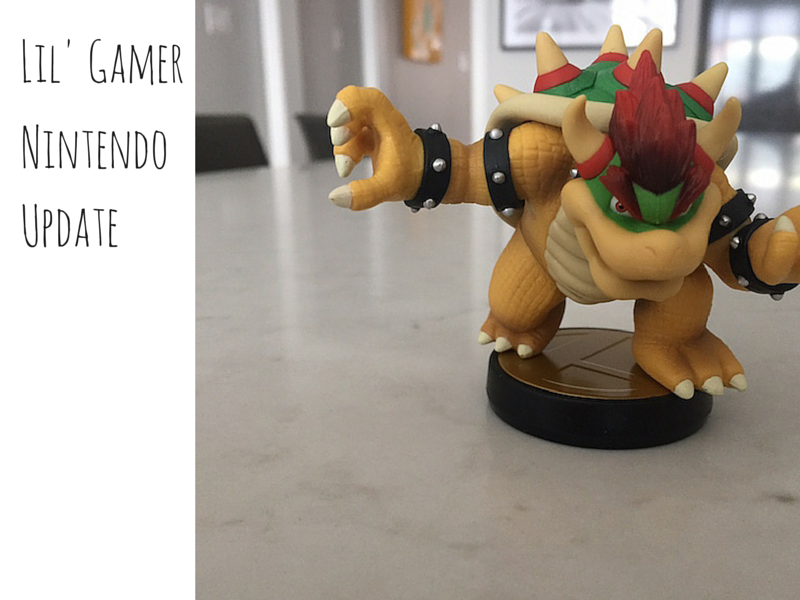 I love it so much, I even bought my own Bowser Amiibo. There is minor cartoon violence but nothing that would stop me from buying the game or recommending it to you. Kirby and the Rainbow Curse is a game I don’t remotely understand but both the kids love it. Basically you use the WiiU GamePad to create rainbow paths for Kirby to walk along while he attempts to return color to Dream Land. 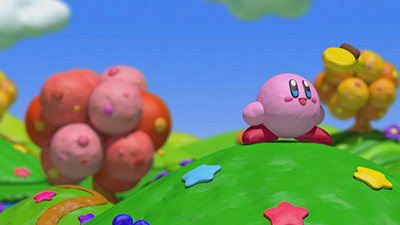 Along the way you receive assistance from a character with a paintbrush who helps transform Kirby into a submarine, tank or rocket to get through obstacles and defeat enemies. I have watched them play quite a bit and will say the game is beautiful. The world of clay is well animated and its pretty fun. I like that the game involves drawing skills and the mechanics of using a pencil or in this case a stylus. 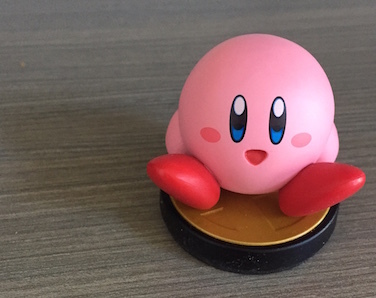 Amiibos work here too and the Kirby one is by far the cutest I have seen. There is very little violence in this game and it is really limited to when Kirby becomes a tank and shoots cartoon missiles. The enemies he hits simply disappear from the screen. I didn’t intend to test out the New Nintendo 3DS XL but after a long exhausting day and a late night flight, I made the mistake of not checking the seat pocket before exiting an airplane. A month later it was clear that Will’s 3DS was not going to be found by the airline and it was time to invest in a new one. Upon opening the box, you can tell the 3DS XL is much larger than the 3DS. Once you turn it on, it is clear the screen is also better and far bigger. Will’s favorite features are that the 3DS XL works really easily with Amiibo (a quick tap on the console), that the screen is bigger, that the 3D features are easier to see, and that there is faster processing power. Yup he actually said faster processing power. I’m assuming Will read the box before I interviewed him for this article and can tell you that with his last 3DS I certainly never heard any complaints about the speed of the device. 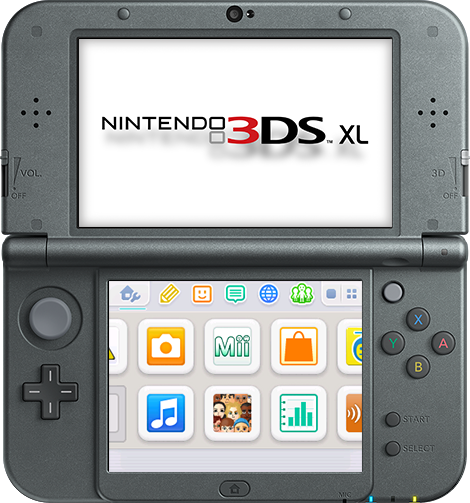 The new 3DS XL has a bunch of other cool features. One is an extra C Stick controller paired with extra control buttons on the top of the device. The camera is also a heck of a lot better. Parental Warning: The new 3DS Xl doesn’t come with a charger. I really can’t explain the decision making on this but assume its because a lot of users have a prior 3DS and the old chargers will work for the new 3DS. We luckily were able to use Will’s old 3DS charger but if buying for a new gamer or as a gift, make sure to also buy a charger. Nintendo has announced some of the exciting new games coming out for WiiU which includes a new game called Mario Maker. Essentially, players will be able to create their own Mario levels and share them online with gamers across the globe. The game is being released in conjunction with the 30th anniversary of Super Mario Bros.
Watch for both me and Will to disappear for a few days when Mario Maker is released to the public. In the meantime, check out the trailer.